News - Page 4 of 4 - Patrick Enterprises Inc.
A newly built “Patrick Chassis” with all new components, along with a Samson body and new vinyl wrap was completed and shipped from Patrick’s shop August 25th to Clive Featherby of Queensland, Australia. Not only did the container hold the new truck, but was full of new parts for Clive’s fleet of Monster Trucks. Dan will be driving the “Aussie” Samson at the South Pacific World Finals 2, Monsters Tour of Destruction, November 14th at the Brisbane International Speedway. 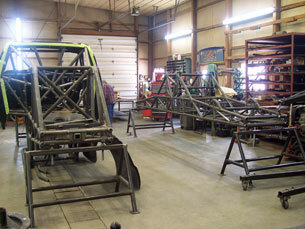 Check out the Photo of the “Two” Samson’s – Will never be another picture of the two trucks together again!! Shortly after this was taken, the truck on the right was loaded in the container headed to Australia. 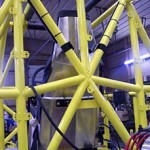 First “Patrick Chassis” To Be Shipped To Finland! 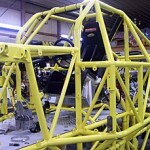 The first “Patrick Chassis” to be shipped internationally left the PEI shop on March 25, 2009 for Alaharma, Finland. It arrived to its new owner, Vesa Kivimaki, on April 27, 2009. 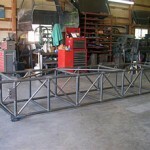 See pictures below of the work in progress, completed chassis and being loaded into the container to be shipped. Pictures to be added soon of the truck with it’s new body. The next trucks to be shipped are to Ian Jones of Gwynedd, Wales UK and to Clive Featherby of Queensland, Australia, where Samson “down under” will be making its deput. 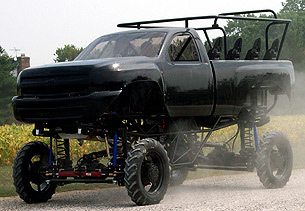 Patrick Enterprises, Inc. Has Taken On A New Project: A Monster Limo! 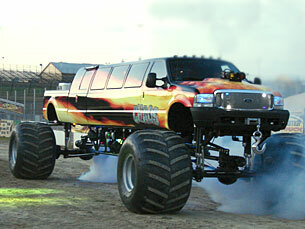 Patrick Enterprises has taken on a big new project…customizing a Monster Limo!! 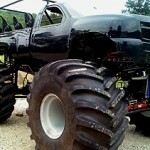 The Monster Limo is owned by Broken Bow Records in Nashville, TN. 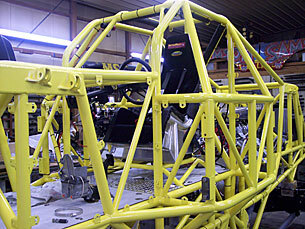 Some of the modifications include a chassis modified with a cradle built and added underneath. 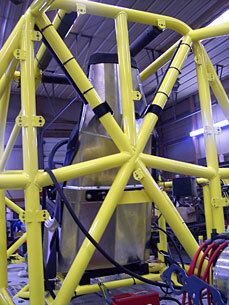 The body / chassis is lifted with large monster truck tires mounted and TV monitors displayed underneath. 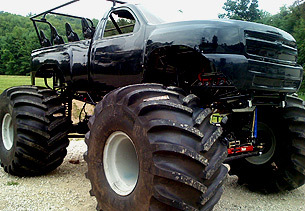 The Monster Limo, “CHAOS,” left the PEI shop July 16th, 2008, to make its first appearance at the Monster Truck Challenge event July 19th at the Myrtle Beach Speedway. Since the tropical storm cancelled the event for Saturday night, Chaos actually made its first light show appearance in St. Louis on July 26th, 2008. 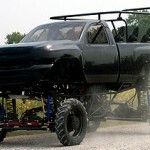 Look for more of this Monster Limo built by Patrick Enterprises. You surely can’t miss it! Patrick Enterprises, Inc. is not only building Monster trucks and chassis’s in the US, but now are heading into the international market!! A complete race ready truck is currently being built and will be shipped to a customer in Wales in the UK and a chassis is also under construction that will be going to another customer in Alaharma, Finland soon, along with other PEI components for the chassis. 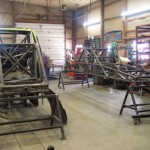 Many of the chassis’s built for Live Nation have raced in Europe for quite awhile,but these are the first two “new” chassis to be directly shipped out of the US to new customers. 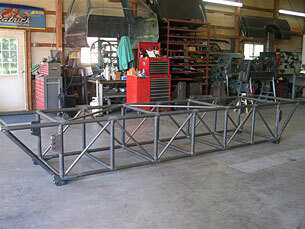 In other news, Dan Patrick completed work on his brand new chassis just in time for the start of the 2008 season!! 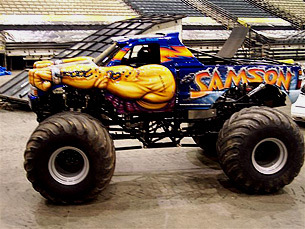 This is first all-new version of Samson in many years, and Dan was very pleased with the performance of the new truck in its debut at the Monster Nationals in Huntington, WV on January 12th, taking top qualifier and the win in its very first racing competition. Patrick Enterprises has completed work on a turn-key “Ride Truck” built for Scotty Ewusiak from Colliers, WV. 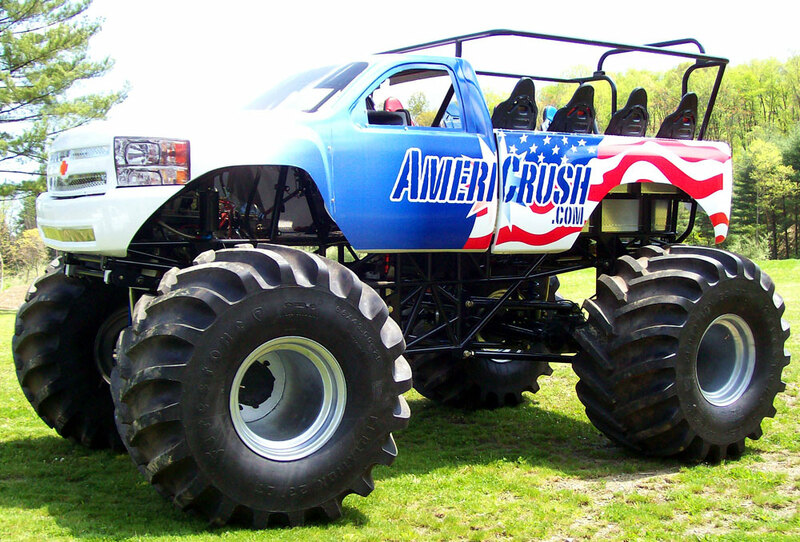 The newly named ride truck “Americrush” was picked up at the Patrick Enterprises shop on Sept. 6th. The above pictures are of Dan test driving the truck before loading it on the trailer. The picture below is the completed truck painted in the American red, white and blue spirit!